Huntsville Emergency Medical Services, Inc. (HEMSI) announced today that former COO Don Webster has taken on the new role of Community Relations Officer and that Dea Calce is the organization’s new Chief Operations Officer. With more than 37 years at HEMSI and 32 in executive leadership, Don Webster has moved into the new role of Community Relations Officer. His focus is on strengthening relationships with community partners and agencies as well as working with HEMSI team members to maximize and maintain positive customer service throughout the organization. Calce becomes COO with extensive experience in both emergency medical services and the Army National Guard. As Relief Shift Supervisor, EMS Program Manager, and Company Commander, he has managed every aspect of emergency medical services operations and readiness during his time with HEMSI, Redstone Arsenal, and the National Guard. He brings a solid history of management success to continue HEMSI’s operational proficiency. HEMSI will join EMS providers across the country May 21-27 to celebrate the 43rd Annual National EMS Week. HEMSI will follow its tradition of honoring fellow first responders in Madison County and will also recognize employees reaching milestones of service. President Gerald Ford first authorized EMS Week in 1974 to celebrate EMS practitioners and the important work they do in our nation's communities. EMS is an established public function and a vital component of medical care. Practitioners help save lives every day by responding to medical emergencies such as heart attacks, accidents, strokes, acute illnesses, and many other situations at the scene of an emergency and en route to a hospital. 2017 continues a partnership between the National Association of EMTs (NAEMT) and the American College of Emergency Physicians (ACEP) to promote “EMS Strong” and ensure recognition of the important contributions of EMS practitioners in safeguarding the health, safety, and well-being of their communities. Each weekday will have a special theme to highlight various aspects of emergency medical services – Education Monday, Safety Tuesday, EMS for Children Wednesday, Save-a-Life Thursday, and EMS Recognition Friday. HEMSI will continue its tradition of feeding employees and their families on Tuesday, Wednesday, and Thursday evenings from 4:00-7:00 p.m. at the Oakwood Station while also sending food or EMS Week gifts to fellow first responders in Madison County. Huntsville Emergency Medical Services, Inc. (HEMSI) employees donated toys at their annual Christmas party earlier this month as part of the HEMSI Cares program. Generosity is entrenched in HEMSI’s culture, and this project of several years for area children is a continual favorite among employees. An ambulance and crew will deliver the toys to the YMCA Downtown Early Childhood Education Center with lights flashing. The EMTs will present each child with a personalized gift wrapped by volunteers through the United Way of Madison County. This annual tradition promises to delight the children and result in countless smiles, as it does every year. The HudsonAlpha Foundation recently annoucned a $100,000 gift from former Huntsville Mayor Loretta Spencer to support the Smith Family Clinic for Genomic Medicine. To recognize the donation, the clinic named the triage room in her honor. Spencer explained that she chose the triage room because of her time as mayor riding with HEMSI crews where she learned the importance of triage. HEMSI is grateful for her acknowledgement and congratulates the Smith Family Clinic. Read the HudsonAlpha story here: http://hudsonalpha.org/hudsonalpha-foundation-receives-a-100000-gift-from-loretta-spencer. Huntsville Emergency Medical Services, Inc. (HEMSI) announced its recent national award from the American Heart Association (AHA) – the 2016 Silver EMS Mission Lifeline Award for implementing quality improvement measures for the treatment of patients who experience severe heart attacks. The Board of Directors and HEMSI CEO Jon Howell also recognized representatives from Huntsville and Crestwood Hospitals and cardiac specialists for their collaborative role in supporting EMS cardiac care efforts. According to the AHA, more than 250,000 people each year experience an ST elevation myocardial infarction (STEMI), the deadliest type of heart attack caused by a blockage of blood flow to the heart that requires timely treatment. To prevent death, it’s critical to restore blood flow as quickly as possible, either by opening the blocked vessel mechanically or by providing clot-busting medication. The Mission Lifeline program rewards EMS organizations that follow advanced protocols derived from American Heart Association/ American College of Cardiology guidelines. The cutting-edge tools, training, and practices allow EMS providers to rapidly identify suspected heart attack patients, promptly notify the medical center, and trigger an early response from the awaiting hospital personnel. Employees celebrated the really cool award with popsicles on a very hot day. As part of the 2016 National EMS Week activities, HEMSI paused to recognize the anniversaries of several employees who have served HEMSI and the community and exemplify the national theme of "EMS Strong -- Called to Care." HEMSI Medical Director Dr. Sherrie Squyres recently earned the highly specialized Emergency Medical Services (EMS) certification from the American Board of Emergency Medicine (ABEM). The organization certifies only those emergency physicians who meet stringent educational, professional standing, and examination standards. Gaining the added sub-specialty in emergency medicine places Squyres in an elite category of recognized physicians nationwide. In addition to her standing as a long-time qualified diplomat of the ABEM, Squyres also met rigorous qualifications for the sub-specialty EMS certification including medical oversight of the EMS team, EMS direct patient care in the field, supervisory functions for the response system, and daily direct medical decision-making and control of EMS-delivered patient care. Her added level of certification will allow her to deliver enhanced direction for initial patient stabilization, treatment, and transport of sick and injured patients. Squyres earned her medical degree from The University of Texas Southwestern Medical School, and completed residencies at the University of Alabama in Birmingham Hospitals and University Hospital in Jacksonville, Florida. She has served as HEMSI’s Medical Director for more than 22 years. She brings critical expertise to the HEMSI team in overseeing all medical operations in addition to providing training and support for the Emergency Medical Technicians. Her involvement improves patient safety and enhances the quality of emergency medical care for patients in the pre-hospital environment. Thanks to these Randolph students for their recent visit to the HEMSI Operations Center where they delivered cookies to show appreciation to emergency workers as part of the school's community service program. Redstone Arsenal Fire LT Dea Calce for his recent selection as the Atlantic Region EMS Provider of the Year. Each year, the Department of Defense recognizes outstanding accomplishments in emergency services through the Annual Fire & Emergency Services Awards. He will go on to represent the Atlantic Region in national competition at Headquarters of the Installation Management Command. HEMSI is proud to have LT Calce work as a part-time paramedic and relief shift supervisor. Congratulations on this remarkable achievement! HEMSI employees donated the toys at their Christmas party in early December to continue the yearly tradition of this community service project. United Way provided support by wrapping and tagging the gifts for the local children.complete with flashing lights and crew. 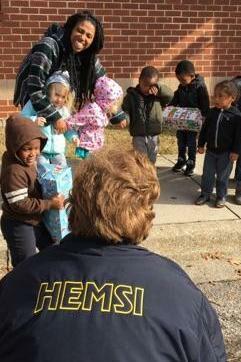 As part of the HEMSI Cares program, Santa helped the EMTs deliver a personalized gift to every single child. Generosity is deep-rooted within the HEMSI culture and this annual project is a favorite among employees. As it does every year, this week’s special delivery met with squeals of excitement and smiling faces. HEMSI received the official international Accredited Center of Excellence (ACE) banner for the distinguished honor of becoming the 193rdEmergency Medical Dispatch Accredited Center in the world. Jerry Overton, Chairman of the International Academies of Emergency Dispatch (IAED) made the presentation for the Salt Lake City-based organization, having traveled to Huntsville to honor HEMSI. The IAED is non-profit, standard-setting organization promoting safe and effective emergency dispatch services worldwide. An Accredited Center of Excellence is the highest distinction in 911 emergency communication services. HEMSI achieved accreditation for demonstrating rigorous compliance to the Medical Priority Dispatch System and associated international practice standards of excellence in system oversight, quality improvement programs, and individual certification of all emergency call takers. The presentation took place at the Huntsville/Madison County 911 Center where HEMSI conducts its call center operations, with HEMSI CEO Jon Howell, HEMSI Medical Director Sherrie Squyres, and 911 Center CEO Ernie Blair offering congratulations to the HEMSI team for the outstanding achievement. Overton explained that in many cases, the emergency medical dispatcher can increase a patient’s favorable outcome. For instance, statistics show that talking a 911 caller through administering CPR to a heart attack victim raises neurological success rates by over 50%. Huntsville – Huntsville Emergency Medical Services, Inc. (HEMSI) received the official international Accredited Center of Excellence (ACE) banner for the distinguished honor of becoming the 193rd Emergency Medical Dispatch Accredited Center in the world. Jerry Overton, Chairman of the International Academies of Emergency Dispatch (IAED) made the presentation for the Salt Lake City-based organization, having traveled to Huntsville to honor HEMSI. District 2 Huntsville City Councilwoman Jennie Robinson recently visited HEMSI to tour the facilities and learn more about the organization. As a new member of the City Council, she wanted to know more about HEMSI’s operations and services. Robinson concluded that HEMSI’s strong reputation is well-deserved. “I would expect nothing less,” she said. 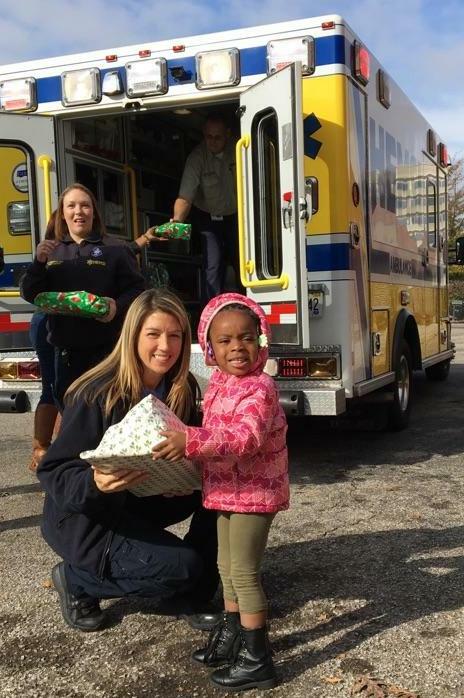 With lights flashing and children eagerly waiting, HEMSI employees arrived in an ambulance to continue the yearly tradition of delivering toys to the Downtown Preschool the week before Christmas. Employees donated the toys at the annual Christmas party with more than 300 attendees as part of the HEMSI Cares program. 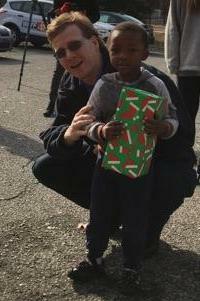 United Way of Madison County wrapped and personalized a gift for each child. This was the fourth year of partnership with the United Way on the community service project, and employees look forward to continuing the tradition in 2015. A 14 year veteran Paramedic for HEMSI passed away suddenly this past Friday, January 10, 2014. John J. Perry II had worked as a Paramedic for 23 years, the past 14 with HEMSI. He had also worked for the former American Ambulance company in Cullman county which is now part of Regional Paramedic Services, and had begun his career with the former Metro Shoals Ambulance Service in Florence in the early 1990’s. He is survived by his children, Nathaniel “Nate” Perry and Kayla Perry and their mother Kim Perry; father and mother, John and Brenda Perry; parent, Sandra Perry; two brothers, Todd Perry and Chad Perry; and companion, Lauren Stanton. Visitation will be Tuesday from 5:00 - 8:00 p.m. at Berryhill Funeral Home. Chapel service will be Wednesday at 10:00 a.m. with burial to follow at Huntsville Memory Gardens. In lieu of flowers, donations may be made to the John Perry II Memorial Fund at Redstone Federal Credit Union. Visitation will be Tuesday, January 14, 2014 from 5:00 - 8:00 p.m. at Berryhill Funeral Home. Chapel service will be Wednesday, January 15,2014 at 10:00 a.m. with burial to follow at Huntsville Memory Gardens. In lieu of flowers, donations may be made to the John Perry II Memorial Fund at Redstone Federal Credit Union. Taking the “HEMSI Cares” mantra to heart, HEMSI employees participated in the American Heart Association’s recent Heart Walk which enjoyed record turn-out. With four teams walking for the cause, HEMSI employees combined to raise over $4,700 in donations. HEMSI Board of Directors welcomed HEMSI Communication Specialist and Team Captain Leslie Esslinger to the last board meeting. Esslinger represented “The Beat Goes On” – the winning team based on the greatest participation and raising the most funds totally over $1,600. In conjunction with the Heart Walk activities, HEMSI held the first CPR competition. Winner turned to be none other than Don Webster who posted the best score on the computerized simulation mannequins of all the HEMSI participants. To HEMSI employees, community support is always the heart of the matter. HEMSI’s Don Webster and Anita Holliday join Liz Hurley for official check presentation. The HEMSI Board of Directors recently received a visit from Liz Hurley who came to offer thanks and acknowledge the efforts and donation by HEMSI employees to the Huntsville Hospital Foundation’s Liz Hurley Breast Cancer Fund. For the past several months, HEMSI Administrative Assistant Anita Holliday – herself, a breast cancer survivor – engaged in developing and then selling special HEMSI “For a Cure” pink-ribbon t-shirts. After garnering $3,800 in proceeds, the Board donated the funds to the Foundation. Ms. Hurley thanked HEMSI employees and the Board for the special project proceeds as well as for 10 years of solid support in the annual Liz Hurley Ribbon Run. Huntsville, AL – Today at 7:00 a.m. Huntsville Emergency Medical Services, Inc. (HEMSI) is launching its Electronic Pre-Hospital Care Report (ePCR) system for dramatic improvement of patient care. HEMSI personnel have been in training for the past weeks to prepare for the shift from paper-based to electronic records. The system, HealthEMS by Sansio, is a remotely hosted field data collection, management, and reporting software solution for ambulance service providers that enables a two-way information flow – a critical benefit to patients through improving the accuracy and timeliness needed to support clinical decision-making. Every working ambulance and supervisor will be using tablet computers linked real-time to the HealthEMS servers, HEMSI offices, and local hospitals. The 25-28 tablets deployed Monday morning are equipped with a variety of security measures, including Computrace – the same security program as used by Huntsville City Schools. The cutting-edge, web-based system is a proven solution for centralized remote data collection and management. Sansio has the largest customer base in the country processing millions of patient encounters annually for some of America’s most prestigious organizations, including FDNY, LAFD, Acadian Ambulance, and other customers in over 40 states. HEMSI Board of Directors President Stan Chapman added, “As one of the premier emergency medical services providers in the country, HEMSI is pleased to implement the best in technology to improve patient care and system performance for the residents of Madison County." Follow HEMSI on Twitter now. HEMSI recently received re-certification by the Commission on Accredited Ambulance Services. The certification process involves a comprehensive self-assessment and an independent outside review. HEMSI, Huntsville-Madison County’s emergency medical transportation company, gave back to the community on Tuesday morning, December 18th via their “HEMSI Cares” program. HEMSI employees donated toys to the Downtown Preschool where kids were thrilled to welcome flashing ambulance lights and noble employees. Paramedics Toni Holaway and Corey Green had the honor of emptying their ambulance full of wrapped toys to guarantee the children would have something to open and play with this season. HEMSI has made this community focused activity a yearly tradition by partnering with United Way for the fourth year. The children at Downtown Preschool will be sure to have a smile on their face this holiday with thanks to HEMSI and United Way.